The evolution of Vanguard's iconic "Bottle Dance"
How many times can bringing a DCI Finalist corps to its knees bring a crowded stadium to its feet? At last count, Santa Clara Vanguard has achieved this act during seven seasons throughout its long and illustrious history. The iconic Bottle Dance, long associated with the Vanguard color guard, is known as one of DCI’s most cherished signature moments. In 1970, the corps first performed the short “Wedding Dance” melody from Jerry Bock and Sheldon Harnick’s Tony and Oscar-winning score to musical “Fiddler on the Roof.” However, It wouldn’t be until 1973 that the corps added the familiar Bottle Dance to the music, a difficult movement requiring a long line of color guard members to link hands and advance forward on their knees. It remained in Vanguard's productions through 1975, then reappeared in 1978, 1979, 1982, and finally during the corps’ 25th anniversary show in 1992. Many concur that DCI Hall of Fame member Pete Emmons came up with the idea, at a time when he was living in New York City and flying in for rehearsals. Vanguard founder Gail Royer collaborated with husband and wife team Pat and Scott Pierson to bring the iconic move to the field. To get an inside look at the legend of the Bottle Dance, we asked those who made it happen to reminiscence on their experiences. Pete Emmons and I were talking after a corps practice in the early summer of 1973. He said something like, "[Your wife Pat] is a dancer. Think she could teach the rifles how to do the REAL bottle dance?" So, in the living room of our apartment, with me singing the music, Pat figured it out. If I recall, the first "official" performance was at a show at Northern Illinois University in DeKalb, Illinois. That's the performance that was on the "Competitive Drum Corps" movie that [DCI Hall of Fame member] Larry McCormick produced, featuring Santa Clara. It was a pretty awesome moment when they did the Bottle Dance with cameramen filming it. The crowd literally jumped out of their chairs. It's almost hard to comprehend the effect that thing had—and apparently still has—on people. The first two years our knees were not on the ground. It was quite a balancing act and quite hilarious watching us learn it. I think the knee issue was a judging thing; nothing could touch the ground per DCI rules. I went through several pairs of tennis shoes over months of rehearsals because our feet would drag from the back to the front. At least in later years, they were smart enough to wear kneepads. The original ladies didn't do that, so they got holes in their jeans as well. Susan Macias remembers: Some of the fields were just the worst on which we had to practice that. I for one have Bottle Dance scars on my knees from having to practice on asphalt or rocky surfaces. Sheri McGinnis Aquilina also remembered the difficult rehearsals: We practiced on asphalt in 1978. Pete Emmons made the guard members buy kneepads because of that. We were always scrambling to pull them up right before we started the Bottle Dance. But it was all worth it. The anticipation was always palpable ... The audience knew the Bottle Dance was coming and the flash bulbs would start to go off throughout the audience. They were like Christmas tree lights. 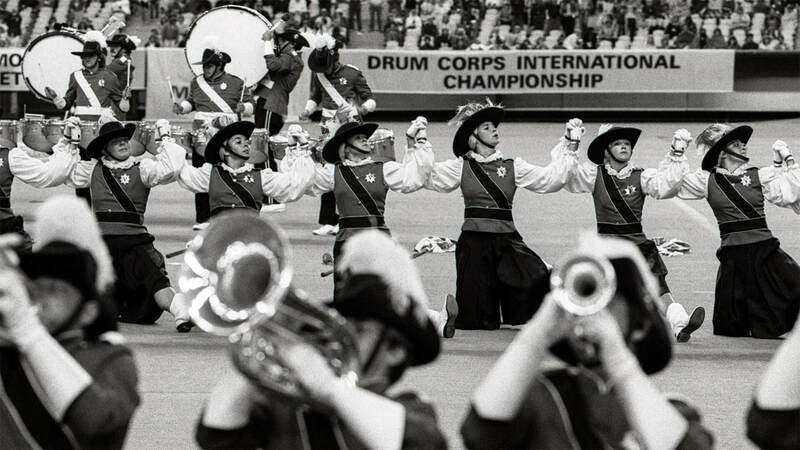 While the Bottle Dance was part of the show in each of the previous seasons, performances in 1979 and 1982 were not added to the corps’ production until the night of the DCI World Championship Finals, surprising and delighting drum corps fans in the stadium. Particularly, in 1982, the Finals night crowd in Montreal was so pumped to see the Bottle Dance set up, their cheers totally drowned out the corps. Consequently, the brass players couldn’t hear themselves across the field, resulting in the two sides ending the show about a second apart. Veronica Flores: In '82, we had secret rehearsals, late at night and in secret locations. Sherri Odribege added: It was announced to us only three days prior to the Finals that we would be performing the Bottle Dance. 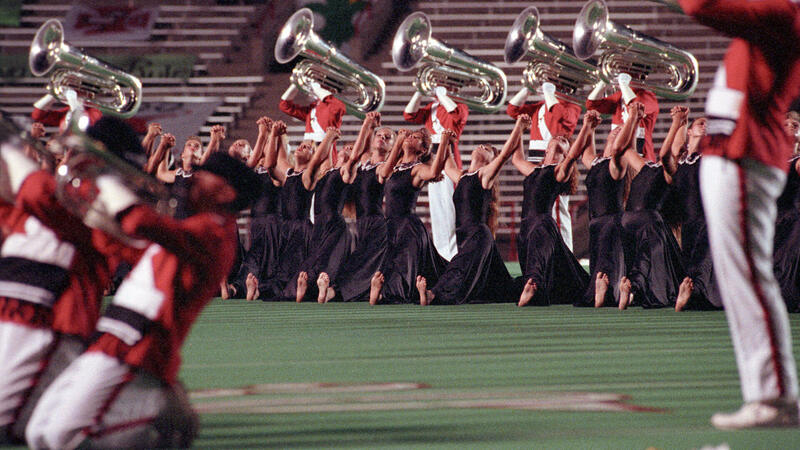 The corps’ most recent performance of the Bottle Dance as part of its competitive production came during Santa Clara Vanguard’s 25th anniversary season in 1992. Kasey Graff Underwood said: I remember in ’92 that the first time we actually did it with the corps at Mission College. Staff member Myron Rosander told us, “Real good girls, but next time, do it without the smiles.” He also addressed the horn line by telling them, “You have to keep playing!” We couldn't help it—we were so excited—and the horn players stopped playing to watch. In discussions with the alumni and former staff of the Vanguard, one common thread continuously appeared—the pride and the goose bumps that came as part of these treasured memories. Cathy Arata said: It is wonderful to hear how all of us, who were fortunate to be part of the “Sisterhood of the Dance,” can so vividly remember the crowd’s reaction and our own pride in being a part of it. Cheryl Bland added: Doing the Bottle Dance even for just one show during my age-out year was amazing. I will remember the response of the crowd forever! When you grab the hand of the person next to you, it is as if you are joining hands with every guard member who has ever done the Bottle Dance … the Sisterhood. Angie McDade Slatton: Two things jump out to me about performing the Bottle Dance. One was the unity it created within the color guard. You can't do the Bottle Dance with a single "weak link." We all had to work hard to make it right. Two was the crowd's reaction. When we stepped into line and joined hands, the crowd went crazy. We all knew we were part of something bigger than us. Scott Pierson: “The "rush" of either doing or playing the Bottle Dance and watching the audience at the same time is something that is quite unique in the human experience. 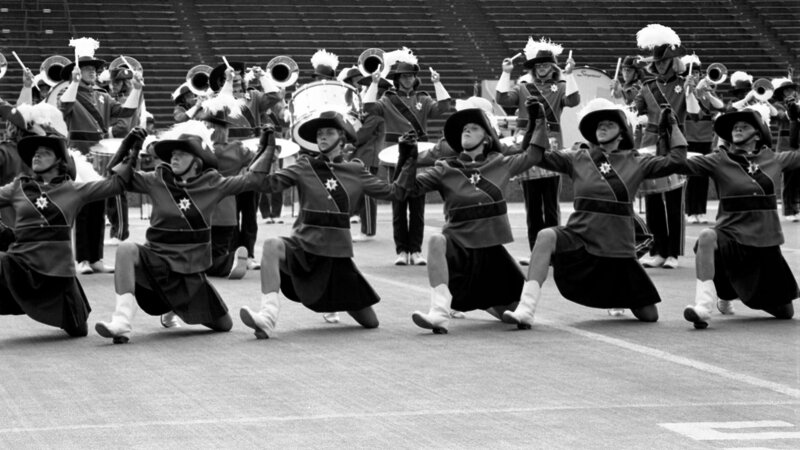 Who would have thought that those movements would become one of the single most iconic moments in the history of drum corps? 1973 rifle section leader, Marilyn Gill may sum it up best: I remember that no one, not Gail [Royer], Pete [Emmons], Scott [Pierson] or any of the rifles who would be performing it had any idea of how it would be received by the audience. I remembered all of us wanting to perform it as perfectly as we could. In those days it was all about precision and perfection. To be one of the first to start to kneel to perform it and watch the reaction from the stadium stands ... I don't think there was ever a better performance moment.